While there's still time to grab both Lara Croft and the Temple of Osiris and LEGO Star Wars: The Complete Saga for free this month thanks to Microsoft's "Games with Gold" program, you can start looking forward to next month when Assassin's Creed 3 "goes gold." The third entry in the stealth action series was the first title to feature a co-op mode, "Wolf Pack." Much as with the series as a whole, this idea would be iterated upon over the course of the next several games, but the original version is still a pretty fun romp. Team up with three other players to attempt a series of stealthy tasks. The better you fare, the more points, XP, and gear you acquire. It's a lot easier than it sounds, especially once you're a few rounds in and you have to be very careful about not getting spotted by guards. Lara Croft and the Temple of Osiris is available until June 15, 2017, while LEGO Star Wars: The Complete Saga is available until tomorrow, May 31. 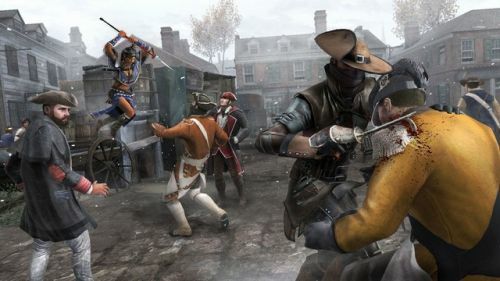 Assassin's Creed 3 will then become available starting on June 1 and go until June 15. Signs Point to Co-Op In Assassin's Creed 3, Then Signs "Disappear"
Ubisoft Testing the Co-Op Waters With Assassin's Creed 3?